Civil society is a contested term that broadly describes the arena of collective social interaction situated between the state, market, and household. Despite being used in a normative manner to encompass a host of values linked with participation and cooperation, it is more commonly used to describe a range of formal and informal nonstate organizations, groups, and associations that form part of the voluntary sector. These usually refer to community organizations, activist groups, trade unions, faith based groups, cooperatives, as well as more formal nongovernmental organizations (NGOs). While business, media, and professional organizations are usually included in definitions, this may vary, as does the inclusion of political groups. Civil society is often used synonymously with NGOs, especially in policy circles, even though, strictly speaking, NGOs represent only one element of civil society, albeit an important one. Within the social sciences, civil society has become an especially important focus for research within international and post socialist development circles as part of debates linked with the collapse of communism in the former Soviet Union and Eastern Europe and democratization processes in the Global South. From a policy perspective, these debates have fed into the neoliberal concerns of the New Policy Agenda pursued by the bilateral and multilateral development organizations that have championed civil society as an antidote to the rollback of the responsibilities of the state. While arguably, geographers have come somewhat late to recog nizing the importance of civil society, more recently, they have been crucial in calling for greater sophistication in the use of the term. This is particularly in terms of acknowledging profound variations in civil society activity, but also its inherently political nature. At the same time, civil society has been widely critiqued by those working from an international development perspective focusing particularly on the problems of using civil society as a policy tool rather than as an analytical construct. Beyond these basic definitions of civil society are a host of variations influenced by disciplinary origin, political perspective, as well as the discord between theory and practice. Also important is that there are not only variations in definitions of civil society, but also diversity within the category. Indeed, there is often a tendency to assume that civil society is homogenous and monolithic. In turn, civil society organizations are often thought to share aims and work together in partnership, especially from a normative perspective. However, empirical studies throughout the world have illustrated that civil society is highly variegated across a range of scales from local to global, as well as by organizational type, purpose, function, and orientation. Especially important is the need to recognize geographical variations in civil society activity that is often strongest in certain areas such as capital cities. In addition, the contextualized local relationships of power, politics, and influence are also critical in shaping the nature of civil society. Thus, some note that a minimum distinction should be made between formal civil society organizations such as NGOs, and informal ones such as social movements. The former is associated with a view of civil society as a collective of organizations while the latter tends to encompass civil society as an arena for action, although these distinctions are not mutually exclusive. Others suggest that it is important to focus on the civil society that actually exists rather than what is presumed to or thought to exist. In turn, civil society must be recognized as dynamic at a temporal level as state–society relationships shift and allegiances within and between different organizations change. It is also important to view civil society as a sphere of social reproduction and organization that has always existed in some form in most societies, rather than an entity. Indeed, definitional problems often arise when civil society is used as a catch all term that implies homogeneity, and for some even renders it useless and/or reified. Perhaps most significant in understanding the multiple meanings of civil society is to contextualize the emergence of the concept through a brief examination of its ideologically complex origins. Indeed, only by doing this is it possible to comprehend the roles and functions accorded to civil society. As a concept, civil society was first coined in ancient jurisprudence and subsequently in Medieval political philosophy. While also mentioned in the seventeenth century, not until the eighteenth century did the term evolve into its current usage, largely through the work of Adam Ferguson. In the nineteenth-century, civil society was widely debated by Hegel, Marx, and later Gramsci, together with others such as de Tocqueville. Some of the core discussions over the centuries centered around the ways in which the state and civil society were related or separate, how civil society encompassed economic interests, and how it functioned as a space for action, and as a buttress against the state. These ideas have fed into contemporary theoretical debates that can be somewhat crudely divided into two main perspectives. The first is the liberal democratic approach that is closely associated with the writings of Alexis de Tocqueville on nineteenth-century North America and especially on the benefits of civic organizations for the creation and maintenance of democracy. Put simply, this view conceptualizes civil society as a largely autonomous sphere of freedom and liberty encompassing an organizational culture that fosters democracy, both political and economic. Civil society is thus viewed as a positive force and potential conduit between the individual and the state. It ensures that the state does not become too powerful, and also instills a sense of participation, duty, and tolerance among citizens. There are several variations and interpretations of civil society within the broad liberal approach. An important one is the regime school that is circumspect about the ability of civil society to foster democracy and places emphasis on state reform. However, it is the neoconservative version that has been most influential in recent years, especially in influencing donor discourses and ‘good governance’ agendas (see below). Here, civil society is viewed mainly instrumentally as important in delivering services through NGOs in a context of a pared down state, as well as helping to prevent ‘nondemocratic’ forces from threatening state power. Another variant encompassed within the liberal approach is the associational school that emphasizes the interrelationships between civil society and social capital. Heavily influenced by the work of Robert Putnam on social capital and civic participation in Italy and later applied to the US, there is thought to be a synergistic relationship between the emergence of a strong civil society and the formation of social capital. The creation of social capital, broadly defined as the relations of trust and participation inherent within social networks and civic organizations, is therefore thought to be one of the positive by products of strengthening civil society. Also Tocquevillian in inspiration, social capital is often viewed in a uniformly positive light, despite more recent critiques that highlight the lack of consideration of power imbalances and social differentiation which may ultimately lead to the further homogenization of civil society. The other main theoretical approach to understanding civil society is the post Marxist or more specifically, Gramscian perspective. In contrast to the liberal democratic approach, this view conceptualizes civil society as internally divided along various lines of social cleavage. Organizations within this sphere may both challenge and uphold ideological hegemony. Most commonly, this approach is linked with the ways in which civil society can act as a site of resistance and struggle against authoritarianism. This was particularly relevant in understanding resistance to such regimes in Eastern Europe and Latin America in the 1980s and 1990s. Furthermore, this perspective can also be associated with the emergence of social movements as important forces in challenging dominant thinking, whether about politics, poverty, gender, or the environment. In part, the post Marxist or Gramscian approach incorporates the many criticisms that have emerged about the liberal democratic view from a theoretical perspective. Although much of this critique relates to the empirical reality of the role and function of civil society on the ground, and especially of NGOs, it still has important theoretical resonance. Perhaps one of the most common critiques relates to the separation of civil society from the state. Empirical reality has shown that the two are intricately interrelated and indeed, interdependent, and that the nature of the interactions is determined by the historical, economic, and political circumstances of particular countries and regions. Linked with these are critiques that challenge the notion of civil society as homogenous, as noted above, but also that it is inherently ‘good’ and automatically harbors and fosters democratic consolidation. It has been widely noted that it is much too simplistic to assume that civil society organizations, and NGOs in particular, will pluralize and democratize. This is because, first, the mere existence of civil society organizations does not lead to a concomitant emergence of democracy, and second, that civil society comprises a huge diversity of organizations that are likely to have competing aims and political viewpoints. Indeed, civil society organizations are just as likely to be founded on authoritarian principles as on participatory and democratic ones. Furthermore, some civil society organizations may align themselves with the state in some circumstances depending on its political hue, while others may deliberately challenge the government of the day. Another important dimension of the liberal and especially neo Tocquevillian interpretations is that as a concept, civil society is Western in origin, yet it is being hailed as a critical component of development efforts in the Global South. Moreover, while early theorization was based on Europe, more recent research has focused on the United States in particular, leading to what some call the ‘Americanization’ of the civil society debate. This refers not only to the normative, partial, and conservative forces behind the resurgence of the concept, but also the enthusiasm for it within US foundations as well as multilateral organizations. From a Southern perspective, there has been much consternation in some circles about the imposition of a European and North American inspired construct, especially in the African context. In particular, concerns have been voiced about the relevance of talking about fostering and strengthening civil society in countries where civil society has existed in various guises for centuries. Others compare the imposition of yet another concept as a form of neocolonialism and another way of imposing neoliberal values on African or other non Western societies. Having said this, most commentators have now come to terms with civil society. Most agree that as long as the concept is used in a way that does not homogenize or prescribe how civil society should function then it can be useful in thinking about how collective organization can be harnessed in order to promote democracy within countries. In the empirical and especially the policy reality of using the concept of civil society, there is often no clear cut distinction between these various theoretical approaches. Indeed, what makes civil society such an important concept is that it appeals to both ends of the political spectrum. However, the liberal, and especially, the neo Tocquevillian approach has strongly influenced development policy discourses led by donor agencies, with little consideration of Gramscian inspired interpretations. Although the liberal approach has dominated policy discussions about civil society, theoretical wrangling is largely absent from donor discourse, with conceptual positions discerned only implicitly. Yet, this should not underestimate the importance of the concept of civil society for the development policy community. Few would contest the fact that civil society has formed an integral dimension of the ‘good governance’ agenda of organizations such as the World Bank, the UK’s Department for International Development (DFID) and the US Agency for International Development (USAID). On one hand, this has highlighted the notion of civil society in checking the potentially authoritarian elements of the state, as well as promoting democratization through participation. On the other hand, it has also fed into neoliberal discourses of reducing the role of the state, enhancing the role of the market, and asserting the importance of the individual. Thus, since the 1990s, donor agencies have increasingly supported the idea of ‘strengthening civil society’ as a way of promoting sustainable development through economic liberalization, state modernization, and democratization. 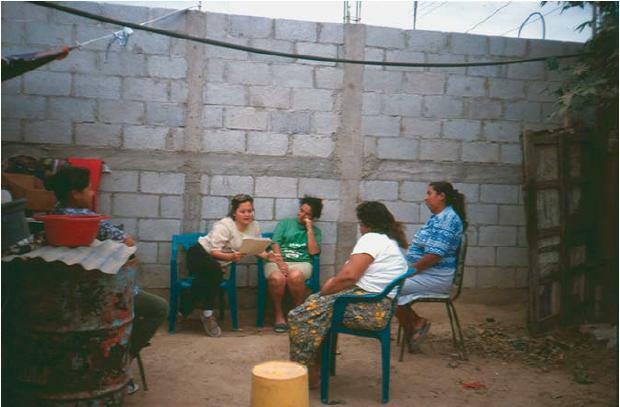 This was facilitated through the establishment of a host of ‘civil society units’ within donor agencies, such as the Centre for Democracy and Governance established within USAID, and the State and Civil Society Unit within the Inter American Development Bank in the 1990s. Within the World Bank, a new structure was introduced in 2002 to facilitate their growing engagement with civil society. This entailed the appointment of 120 Civil Society Engagement Specialists working in country offices as Civil Society Country Staff, in a Civil Society Group in the Washington Headquarters; together they constitute the Civil Society Team. One critically important aspect of donor engagement with civil society is not only the liberal and often neoconservative theoretical influence on understanding of the concept, but also the almost universal way in which donors tend to equate civil society organizations with and so reduce them to NGOs. Thus, donors have increasingly channeled funding through NGOs. This has involved first, an attempt to ‘build civil society’ and promote citizen engagement, mainly through institution and capacity building and partnership programs, and second, to finance the alternative delivery of services that have been eroded due to the paring down of the state through neoliberal structural adjustment policies. Although NGOs have now become major players within development policy, their increasingly powerful roles have generated considerable criticism, some specific to NGOs and some linked with the wider use of the concept of civil society. Indeed, many of the problems with the enhanced role of NGOs in delivering development relates back to the earlier critiques of the liberal democratic and normative theoretical perspective discussed above. One key issue is that donors often ignore the huge diversity of NGO activity and NGO types; just as civil society more generally is diverse, so are NGOs (see also below). This becomes a particular problem for donors who tend to assume that NGOs have a greater capacity to reach the poor, and to promote local participation. However, many NGOs do not necessarily work with the poor, nor do they involve citizens or those at the grassroots in their work. Indeed, it is really grassroots and community based organizations who work at this level, and who often have much more democratic internal management structures than larger NGOs. Linked with this is that the function of NGOs is also diverse yet often ignored by donors. One of the main distinctions, for example, is between those that provide services (sometimes referred to as ONGOs – operational NGOs), and those that are involved in policy advocacy around such issues as the environment or human rights (sometimes referred to as ANGOs – advocacy NGOs). Not surprisingly though, it is the former who receive most donor funding. The other main area of criticism revolves around accountability. As NGOs become more dependent on donors for funding, so they may become more accountable to the donors rather than their beneficiaries. Among larger NGOs in particular, their relationship with donors can potentially undermine their effectiveness in terms of being able to claim or assert independence to the point that they are ‘too close for comfort’. There are also issues regarding the conditions imposed on NGOs who receive funding. Often, monitoring of the performance of NGOs involves reporting how money is spent and whether the appropriate activities have been undertaken, but it rarely involves whether NGOs actually make a difference, especially in more intangible realms such as ‘participation’ and ‘empowerment’. These issues are more important to some NGOs than others, for example, those addressing gender issues are more likely to view empowerment as a major measure of success (see Figure 1). All these concerns may ultimately serve to undermine the effectiveness of civil society and the neo Tocquevillian goals of promoting democracy and participation so valued by donors. At a broader level, donor attention to civil society through NGOs has also been criticized for failing to address structural issues underlying poverty and inequality by concentrating on the local, as well as to neglect the political dimensions of the functioning of civil society. Despite these problems, civil society and NGOs still have an important political role in terms of mobilizing people to demand their rights, even if the sector does not command sufficient funds to transform the livelihoods of the poor on a large scale. In turn, while representation may be partial and uneven, at least there is now recognition of the importance of including the views of civil society at all stages of the project cycle, even though this may be implemented in an imperfect manner. One important example here is the role according to civil society in the World Bank’s recent Poverty Reduction Strategies. An integral element of Poverty Reduction Strategy Papers (PRSPs) (which outline the formulation of this strategy) is that civil society is consulted and their views included as part of an effort to make them ‘country driven’ and ‘stakeholder led’. Although the success of civil society participation has been criticized as being shallow and insufficient, efforts are being made to try and increase their participation. 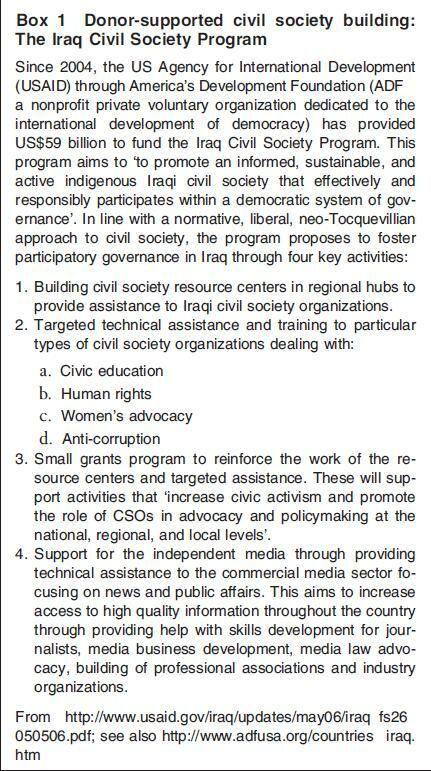 Another area where strengthening civil society has been important is in post conflict reconstruction. 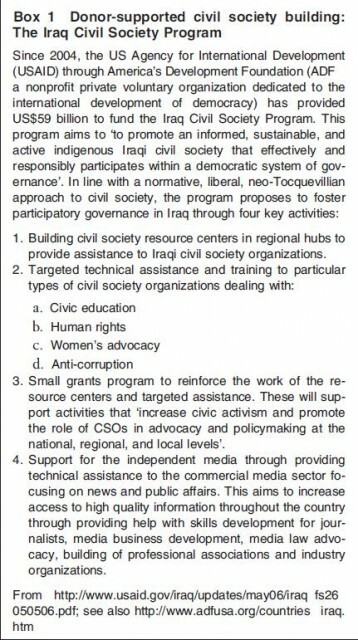 In so called ‘post conflict countries’ such as Guatemala, El Salvador, and Iraq the active construction of civil society organizations and their inclusion in national level decision making has been seen as central in peacebuilding initiatives (see also Box 1). As noted above, spatial variation is an important element in recognizing the diversity of civil society, prompted largely by the work of geographers. Not only are civil society organizations often distributed in spatially concentrated ways, they are located across the world at different spatial scales comprising a host of different sized organizations. Therefore, civil society organizations can refer to very small scale community based organizations at the grassroots level, to larger regional or nationally based organizations, to umbrella groups comprising several organizations, and to international NGOs. There are also complex spatial interactions between these different levels of civil society activity. In addition to donors, large international NGOs (sometimes referred to as INGOs or BINGOs – big international NGOs), are also increasingly channeling development funding through smaller civil society organizations. This is usually through national level NGOs, which tend to be single issue based (sometimes referred to as NNGOs). Therefore, transnational linkages have been important in influencing the nature of aid flows to NGOs through complex networks and geographies over a range of scales, with flows from larger northern NGOs to smaller southern NGOs being the most significant routes of such flows. At the international level, there has also been considerable interest in ‘global civil society’. Broadly conceived, this refers to global citizen action that operates beyond the limits of national boundaries, politics, and economic concerns. The emergence of global civil society is generally associated with the growth of international NGOs in the 1990s and their growing participation in global decision making in major international conferences (mainly the UN conferences such as the Rio Earth Summit in 1992, the Cairo Population conference in 1994, and the Beijing Women’s conference in 1995). As with civil society, global civil society is a normative concept that tends to focus on the importance of dialogue and ethical principles through social change and democratization at the global level. It is also viewed as a space for ‘anti-politics’ and is often associated with the anti-globalization movement, and with groups linked with promoting a ‘common good’ rather than say global terrorist organizations (such as Al Qaeda). However, somewhat contradictorily, on the one hand, global civil society is linked with the propagation of Western and imperial hegemony, while on the other, a site for a radical rethinking of global governance that will provide an alternative to neoliberal globalization. As with civil society more broadly, these views depend on the theoretical viewpoint taken. What is agreed is that global civil society is strongly contested and cannot automatically be assumed to comprise a global democratic polity. How Useful Is Civil Society? In light of the highly contested nature of civil society at all scales, it is pertinent to ask whether civil society has any value as a concept and as a way of describing collective social groupings. It is undeniable that civil society has now entered the social science lexicon and that it is here to stay both theoretically and in terms of the policy environment. Indeed, as several commentators have suggested, civil society is more than a buzzword, not least because it facilitates the assessment of the relationship among the individual, society, and the state. However, for it to be useful, it is appropriate to distinguish between civil society as an analytical concept and as a policy tool as noted above. At the conceptual level, it has and will continue to generate very important debate about the nature of democracy and the role of nonstate actors locally and globally. In terms of policy, the integration of civil society into donor discourse has been critical in recognizing a sector of society that had hitherto been ignored. It has given civil society an intellectual and concrete space to have some say in how society is organized and how problems are solved. While certainly, civil society is ambiguous and often imprecise, this can also be a benefit. However, it is essential to recognize the varied intellectual dimensions of the concept and not assume it uniformly operates for the common good as the liberal approach suggests. In turn, civil society must be recognized as diverse, internally variegated, and comprising a host of different and often competing functions and aims. Civil society is dynamic, shifting, and varies across time and space reflecting the heterogeneity of the organizations that form it. Yet, it is also a vibrant arena that is essential in one form or another in all societies of the world, as long as its limitations are taken into account.